Just over one month past their tenth anniversary, Titan Fighting Championship is certainly celebrating in the proper city: Miami, Florida. Titan FC 38: Muhammad vs. Carl marks just the second time the long-tenured promotion will grace the Sunshine State with a fight card—their first visit, Titan FC 31: Green vs. Torres, was back in October 2014 in Tampa. With scant other similarly statured events are on deck anywhere else this Saturday, this event will likely draw more eyes than usual, especially with the support of the UFC subscription service, UFC Fight Pass, which will stream the event live into millions of homes nationwide. The main event—a contest for the vacant 170-pound title between inaugural World Series of Fighting welterweight champion Steve Carl and undefeated former Bellator fighter Belal Muhammad—is certainly deserving of its place atop the marquee, but the real meat of the card is in its supporting acts. From former UFC fighters like heavyweight Jack May, Pedro Nobre and Yosdenis Cedeno, to underground sensations like Chase Sherman and Reynaldo Walter Duarte, to overseas talent like Corey “Capcom” Tait, this event has a lot going for it in terms of violent entertainment value and quality competitors. Read below for the full card, along with breakdowns of the four most compelling fights of the night. Before he ran into the currently dethroned and outcast leg lock specialist Rousimar Palhares, Steve Carl—a more than ten-year veteran of the sport—was on a tear enviable even in the highest echelons of the sport: six consecutive first-round submissions, capped off by a seventh submission victory in the fourth round over an extremely durable Josh Burkman to capture the inaugural WSOF welterweight title. Contractual disputes jettisoned the Iowan from the promotion and for more than a year he found himself without a promotional home. Carl entered the Ultimate Fighter house but was eliminated. A one-off bout in the Russian promotion, WFCA, netted him a much-needed rebound win via third-round submission. Just like that, he was back in the winners’ circle, a viable contender once more. In Duke Roufus product Belal Muhammad he faces a well-oiled machine whose primary directive is to shut down all of his opponent’s offensive output. A consummate grinder, the former Bellator competitor has never tasted defeat and has never won by anything less than a unanimous decision. Physically, Carl is the larger and likely stronger fighter, and his ability to remain deadly into the championship rounds will no doubt keep Belal on high alert. This will be a contest of nuance. I give the edge to Carl in terms of experience and finishing ability, but Belal should definitely be taken seriously. A teammate of MMA stalwart and inaugural Titan FC lightweight champion Pat “Bam Bam” Healy, Jason Novelli has a rather unique insight into what it takes to succeed in the most populous weight class in MMA. A decade-long student of the game, “Flipside” has run into just one speed bump in his finish-laden path up the lightweight ranks. He’s a game fighter with a solid fight IQ, but more than his combative acumen, it’s his genuine affection for the fight game that propels him forward; the guy just loves to fight. The same can be said for hard-hitting Miami fighter Yosdenis Cedeno, a combatant whose career highs and lows are marked by one constant: legit opposition. Since his professional debut, “The Pink Panther” has fought some of the toughest regional fighters available—a proclivity that did not go unnoticed by the UFC, who scooped him up for a year between July 2014 and July 2015. This is a terrific crossroads contest whose outcome is all but predictable. Jack May was undefeated before he signed with the UFC. He faced Derrick Lewis and Shawn Jordan in back-to-back bouts and faltered in both battles. Now 7-2, the towering 6-foot-8 bruiser from Chino Hills, CA is due for a rebound win. But there are no easy bouts in Titan FC, as demonstrated by his Mississippian dance partner, Chase Sherman. The 26-year-old knockout machine has only one recorded loss on his record—a first-round knockout to UFC light heavyweight Alex Nicholson—and, unlike his opponent, he’s coming into this bout with three consecutive first-round knockout wins. According to inside sources, May has been very quiet in the lead-up to this fight. This could mean he’s especially focused and, consequently, on the verge of a highlight reel comeback win. However, it could also easily indicate he’s fallen on hard times, motivationally. Conversely, there is nothing dubious about Sherman’s mood coming into this bout. This is clearly the biggest fight of his career. A win over a fighter like May could vault him into the big show immediately, as there is, has been and will likely continue to be a shortage of legitimate heavyweight talent under the age of thirty in most top promotions. That said, if May’s head is clear and his heart is determined, we might end up watching a lesson take place in the cage this Saturday. His stateside greeter, Andrew Whitney, is about as far from a cakewalk introductory opponent as one could imagine outside of the UFC, however. The Springfield, MI to Boca Raton, FL transplant is a well-rounded crusher of dreams and will prove a broad test for the incoming Brit. 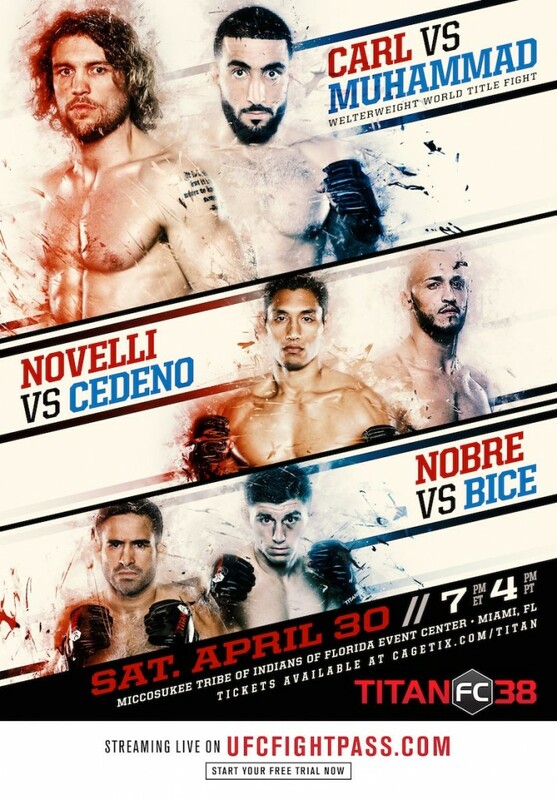 Titan FC 38: Carl vs. Muhammad will be held at Miccosukee Resort and Gaming in the Miccosukee Tribe of Indians of Florida Event Center, 500 SW 177th Avenue, and will stream live on UFC Fight Pass. Click HERE for tickets. Fights begin at 7PM ET.